When it comes to fast food there aren’t any more famous burgers than the Big Mac from McDonald’s and the Whopper from Burger King. These two burgers are the backbone of the two restaurants due to their overall taste, value, and popularity. Although both burgers are made from beef, they do vary in taste quite a bit and we will go over each burger later in this article. The Big Mac is not your average burger. Even when you first see it, you will be surprised by the way it looks. That’s because it doesn’t have an ordinary bun. It actually has a 3-piece bun, which consists of top, bottom, and middle. The middle bun separates the two beef patties. Other ingredients in the Big Mac include two 100% pure beef patties, special secret sauce, American cheese, lettuce, minced onions, and pickles. If you are like me, you would probably tell them to hold the onions. View our earlier article where we talked about the Big Mac price and nutrition. When compared to the Big Mac, the Whopper looks like your normal oversized burger. However, the looks do not do this burger justice. The Whopper is one of the tastiest fast food burgers the money can buy. It also comes with three options: single, double or triple patty. 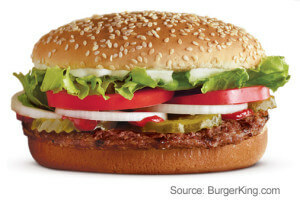 The Whopper consists of a sesame seed bun, lettuce, onions, mayo, beef patty, tomatoes, pickles, and ketchup. As you can see, there are not secret sauces such as the one used on the Big Mac, but that doesn’t make the Whopper any worse. The awesome thing about the Whopper is that it is surprisingly juicy. The mixture of all of the ingredients causes a flavorful eating experience and a satisfaction for your taste buds. View more information, such as the Whopper price and nutrition. So how do these great American burgers stack up against one another? Our comparison will include the Big Mac against the single-patty Whopper since their serving sizes are similar (215g for the Big Mac and 277g for the Whopper). Just for the comparison’s sake, the serving size is 347g for the Double Whopper and 417g for the Triple Whopper. There’s a reason they call it the Whopper, eh? As you can tell from the serving size, even the single-patty Whopper is much bigger than the Big Mac. That means it also has 80 calories, 11g of carbs, and 6g of fat more than the Big Mac. Despite the Whopper having more caloric content than the Big Mac, they are still very similar and comparable burgers. It all comes down to what you like more. The Big Mac is very unique due to its buns and special sauce; however, the Whopper tends to be juicier because its patty is softer and thicker. Even though the Whopper is the larger burger of the two, the Big Mac will run you about 50 cents more. So which burger should you try first if you haven’t tried either of these before? My answer to that question would be the Big Mac. 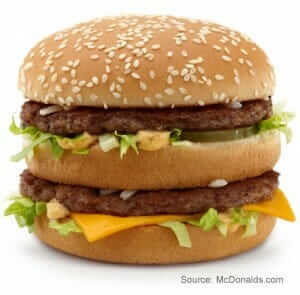 The Big Mac is truly a spectacular burger to have once in a while and give your taste buds a treat. But beware; too many Big Macs and you are looking at an unhealthy lifestyle coupled with a likely gain in body weight. And that would most likely be true with either of the two burgers. Which burger do you like more, the Big Mac or the Whopper? Tell us in the comments. I rather have the Whopper for this reason the Big Mac doesn’t stand up to its name. The beef patty is too small to call it a Big Mac and most times I don’t get a whole beef patty. So calories don’t really matter as long as I’m getting my moneys worth. my big mac IS a whopper!